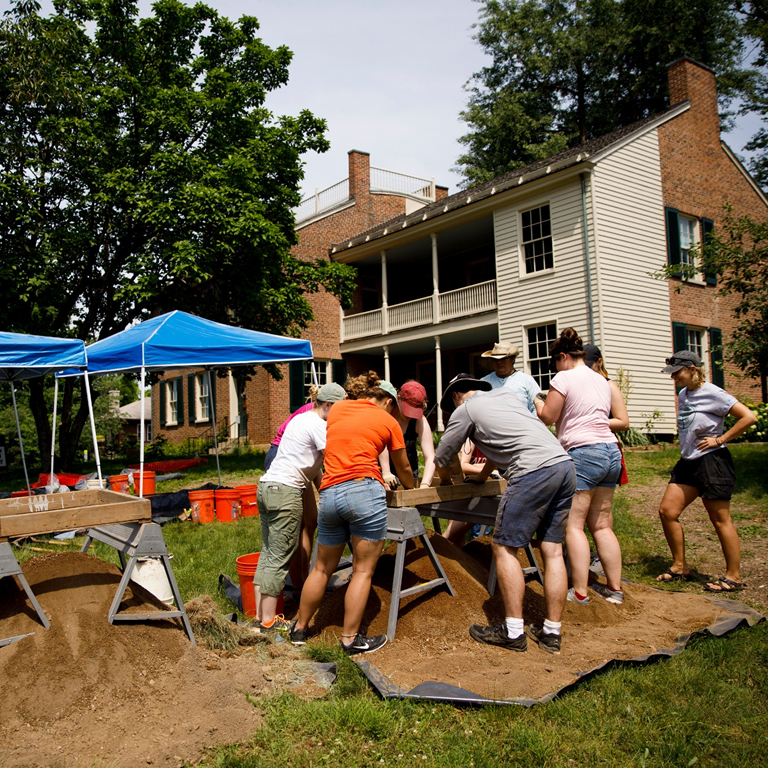 A new excavation project gave Indiana University Bloomington students the opportunity to explore and uncover the past of IU's oldest property, the Wylie House. The Glenn A. Black Laboratory of Archaeology, the Wylie House Museum and the Office of the Bicentennial teamed up to discover more about the university's heritage and culture. Wylie House director Carey Beam said one of the project's broader goals was to more completely understand the social and cultural impact IU has had on Bloomington, Monroe County and Indiana. The four-week Bicentennial Archaeological Field School was offered to students who had an interest in archaeology and Bloomington history. Students who participated got hands-on experience and received course credit. Elizabeth Watts Malouchos, Glenn A. Black Laboratory research scientist and principal investigator for the project, said the team of 11 students located one greenhouse and a possible corner end of a second, which was the primary focus of the excavation. Until the excavation, no one knew for sure the location of the greenhouses, or whether they even existed on the property of the 1835 Wylie House, home to IU's first president, Andrew Wylie. "Not that much was known about the greenhouse," said Maclaren Guthrie, an IU Bicentennial intern and IU Department of Archaeology undergraduate assistant. "We were just hoping we could fill some of the gaps and understand. The whole thing was labor intensive but truly fun." Before the excavation, Indiana Geological and Water Survey director Todd Thompson conducted a ground-penetrating radar survey to remotely detect archaeological features below the surface. Thompson's work helped the excavation team determine where to start digging. For every 10 centimeters of ground that was excavated, the dirt was sifted through a mesh screen to make sure no artifacts were missed. After an artifact was found, it was taken to be gently cleaned in bowls of water and then moved into plastic bags, so they could be labeled. Among the artifacts found were a toy horse, marbles, bricks, buttons and ceramics. Guthrie found out about the field school through Malouchos, who she has worked under in the past. She has some past experience with the Wylie House Museum, a unit of IU Libraries, where she conceived and organized an exhibit on heritage archaeology. "I enjoyed the excavation and analysis parts of the dig over anything else," Guthrie said. "Even a simple act of screening soil leads you to find these great historical artifacts that are buried underground." Malouchos praised the team's dedication. She said there was a lot of preparation work, including scooping buckets of water out of the dig site after a rainy day and putting up and taking the tents that cover the site every day. Even during bad weather, the team still worked hard on the site or cleaned and sharpened the tools. Students were trained to take thorough notes of everything they found, as their research could be used by others down the line. "One of the best parts of archaeology is these students can take the methodology that they learned at this field school and do research anywhere, for any time period or place," Malouchos said. IU undergraduate students were not the only ones who benefited from the experience. The field director, anthropology graduate student Molly Mesner, had most of her prior experience in the Middle Woodland Period of pre-Columbian Native American culture. "Although this was my first in-depth experience with post-contact-period excavations, all archaeological sites are non-renewable resources; once they're excavated by archaeologists, they are gone forever," Mesner said. "Because our future is based on the lessons we learn from those who came before us, it is extremely important to have field schools like this one that make the past accessible to both archaeologists and the local community." Volunteers also took part in the dig experience every Friday of the project. The next stage of the project consists of a fall-semester class on processing the artifacts that were found. The students will begin to carefully catalog the items, and identify their age and the correct way to store them. The artifacts will then be put on an online exhibit for the public. Beam said she hopes the Wylie House Museum will continue another archaeological dig next summer.